This is a great weekend for a vacation in Savannah! There’s no bad time to visit Savannah, but October is packed with things to do in Savannah! Pirate Fest on Tybee Island, Oktoberfest on River Street, and Picnic in the Park in Forsyth Park, are all this weekend October 6th through the 9th! You’ve got some tough decisions to make for this Savannah vacation weekend. 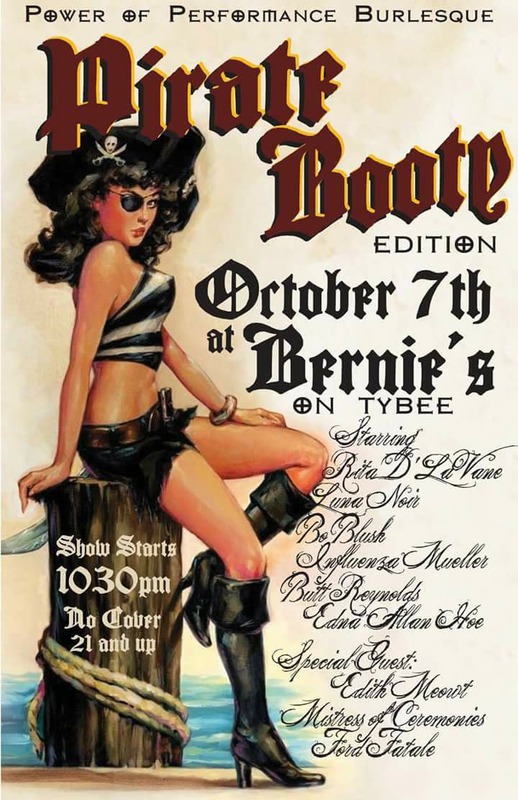 Do you go all out on Tybee Island, buy a fake parrot, put on an eye patch and throw back some grog? Or don your best lederhosen, buy a beer stein, head to Savannah’s River Street, and sample the finest German beers and brats? If Picnic in the Park is more your speed, grab a blanket, your picnic basket, and enjoy live music at the bandshell in Forsyth Park. 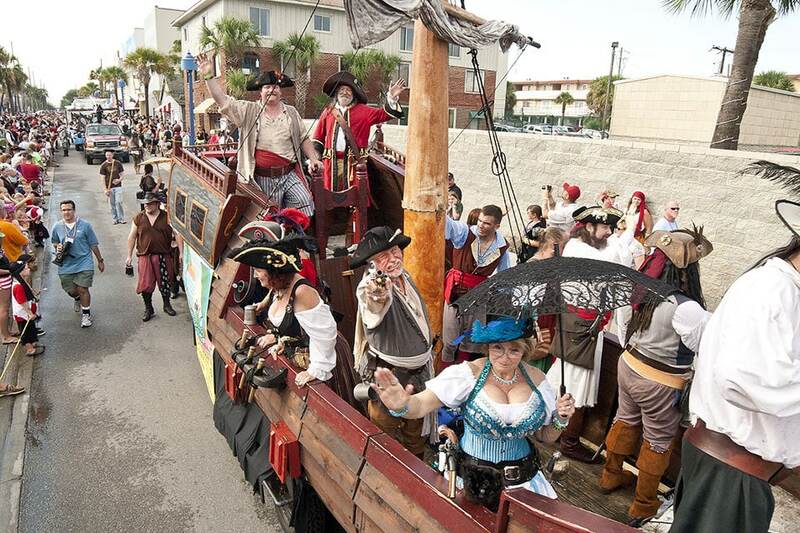 A Tybee Island tradition since 2005, Pirate Fest draws thousands of Savannah residents and vacationers to Savannah every year. If this is your first time vacationing in Savannah, and you don’t know anything about Pirate Fest, the main info is this: Party with the family and make new friends, but everybody’s a pirate! Don’t worry if your wardrobe isn’t heavily invested in pirate gear, you can get everything you need at the festival. The Thieves and Gypsies Market, is an outdoor bazaar where you’ll find all the latest in 1700’s fashion for the discriminating ocean-raiding bandit. The market sells attire and accoutrements for pirates of all ages, sizes, and sexes at prices that won’t break the treasure chest. 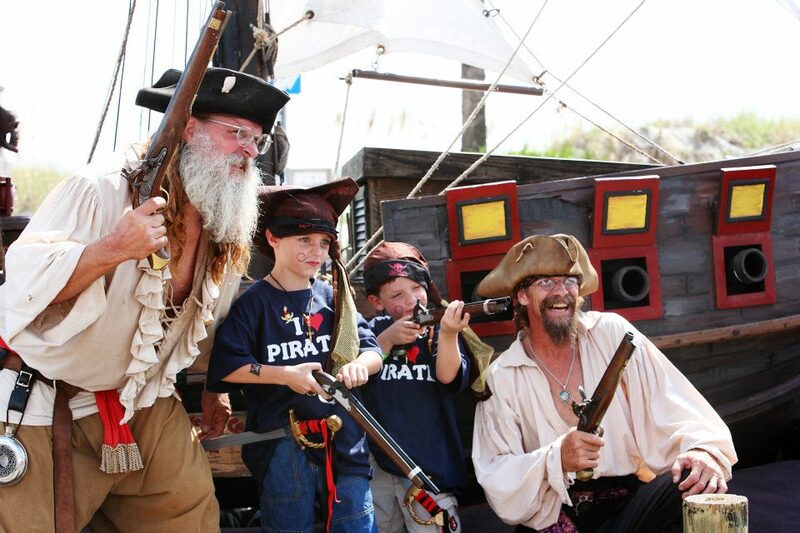 Pirate Fest is a family-friendly event…but it’s also a party for the grown up’s too! The younger pirates will love Little Matey’s Cove, where they’ll bounce around in a 28 foot pirate ship, go down slides, and have fun at the petting zoo. If they can sit still long enough after eating funnel cakes and cotton candy at the Kiddie Carnival, face painting is the in-look this year. For the adults, live music plays at the Main Stage. Listen to music and grab a drink at The Whatever Bar, which is operated by Bud Light, or catch a pirate-themed burlesque show at Bernie’s on Tybee. IS THAT DOG A PIRATE? Who will be crowned 2017’s King and Queen? On Saturday, the costume contests are judged. There are many categories, and winners will be chosen for the best in pirate men, women, children, and…dogs? 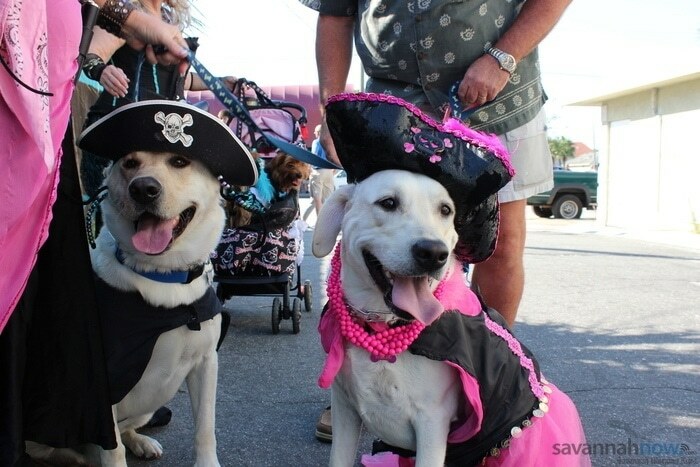 Yes, even dogs come decked out in pirate garb for Tybee Island Pirate Fest 2017. Everyone, including pets are welcome at the festival, costumed, or not. It’s just way more fun to run around pretending to be a pirate, though, isn’t it? Pirate Fest 2017 crescendos into the parade on Saturday October the 8th. Starting at 3pm and lasting until 5pm, the parade goes from Tybrisa Street all the way to 2nd Street. Massive crowds line the route, creating what is possibly the best family-friendly street party on Tybee Island all year! Kids under 12 are free, adults can buy passes here. Friday October 6th 4:00pm to 11:00pm, Saturday October 7th 10:00am to 11:00pm, Sunday October 8th 10:00am to 9:00pm River Street. FREE! The 34th annual Oktoberfest in Savannah isn’t just beer, bratwurst and polka dancing, though there will be plenty of that to be sure. The opening ceremony – Tapping of the Keg is at 4:00pm on Friday. River Street will be taken over with crowds of celebrants enjoying German beers in to-go cups, eating German cuisine, buying German arts and crafts, and listening to Oompah bands. At 6:00pm on Friday, the feats of strength begin with the River Street Keg Rolling races. Walk the bars on River Street or listen to live music or comedy until the fireworks show starts at 9:30pm Friday night. Bars in Savannah are open until 3:00am on Fridays and Saturdays, so you don’t have to go home at 11:00 if you don’t want to stop celebrating. 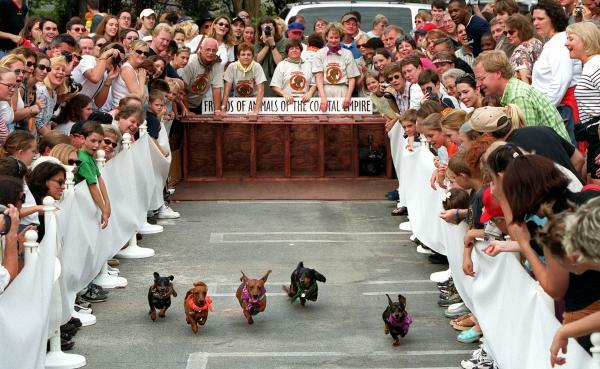 Have you ever seen a “wiener dog” race?? It’s exactly as glorious as you think it could be…two hours of dachshund races starting at 11:00am and culminating with a champion at 1:00pm. To enjoy the truly entertaining spectacle that is weiner dog racing, head to Morrell Park. Located at the east end of River Street, Morrell Park is Savannah’s only riverfront park, and features the famous “Waving Girl” statue, and the 1996 Olympic Cauldron monument. Morrell Park will be easy to find on Oktoberfest Saturday, as dachshunds aren’t the quietest of breeds! 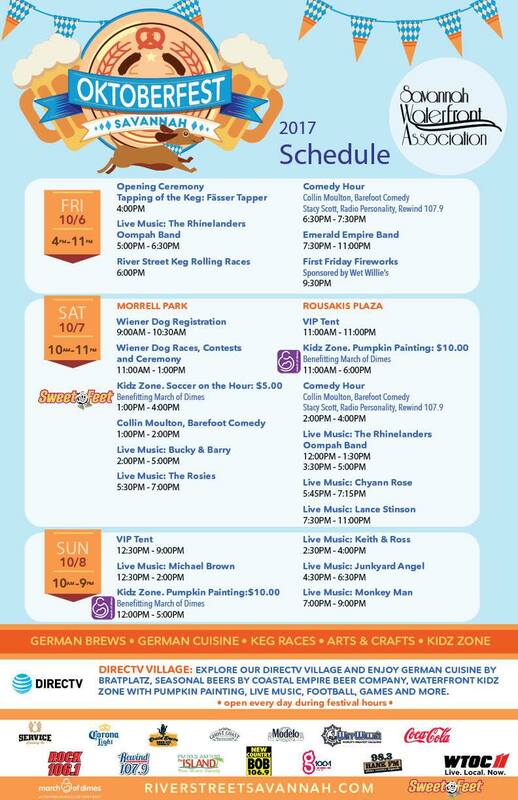 Oktoberfest runs all weekend, and although after dark the festival is more adult oriented, there is a Kidz Zone that is open in the afternoon with soccer on Saturday and pumpkin painting on Sunday. The beer, the food, and the polka awaits you everyday until the festival “officially” ends Sunday at 9:00pm, although most bars won’t close until 2:00am on Sunday. PICNIC IN THE PARK: LIGHTS, CAMERA, MUSIC! Sunday October 8th, 3:30pm to 9:00pm Forsyth Park Bandshell. FREE! On Sunday October 8th, the US Army 3rd Infantry Division Color Guard will perform with the Savannah Philharmonic….with Live Cannons! Possibly up to 20,000 people are expected to gather in Savannah’s Forsyth Park to enjoy an evening of free musical performances and eat a fancy dinner from home. Veterans arrive early to stake out their favorite spots, and decorate their areas for the Hollywood themed picnic venue contest. The truly dedicated competitors create elaborate scenes in their cordoned off areas: buffets, director’s chairs, movie sets…all hoping to win a big prize from the contest’s sponsor. This years Hollywood theme “Lights, Camera, MUSIC” promises attendees a rare opportunity to hear popular famous film scores performed live by a professional orchestra. The organizers have leaked that music from the “James Bond” franchise, and “Pirates of the Caribbean” are on the set list. Picnic in the Park is a lot of fun, and at the price of FREE*, what better way could you spend a Sunday evening in Savannah? With all that’s going on in Savannah this October (Don’t forget the upcoming SCAD Film Festival later this month, featuring *Gasp! * Captain Picard! ), if you need a place to stay for your Savannah vacation, theres lots of options. Savannah Dream Vacations has a Savannah vacation rental home near all the action! Stay directly on Forsyth Park in the Jepson Estate, George Hummel House, or Romantic Cottage. For Oktoberfest, enjoy the festival and watch the crowds from your balconies on River Street in the River Street Home. Going to Pirate Fest? Stay at the Tybee Island Waterfront Retreat. Book a private Savannah vacation rental with Savannah Dream Vacations to be close to the action! Nightlife in Savannah 2018: Made in Savannah! 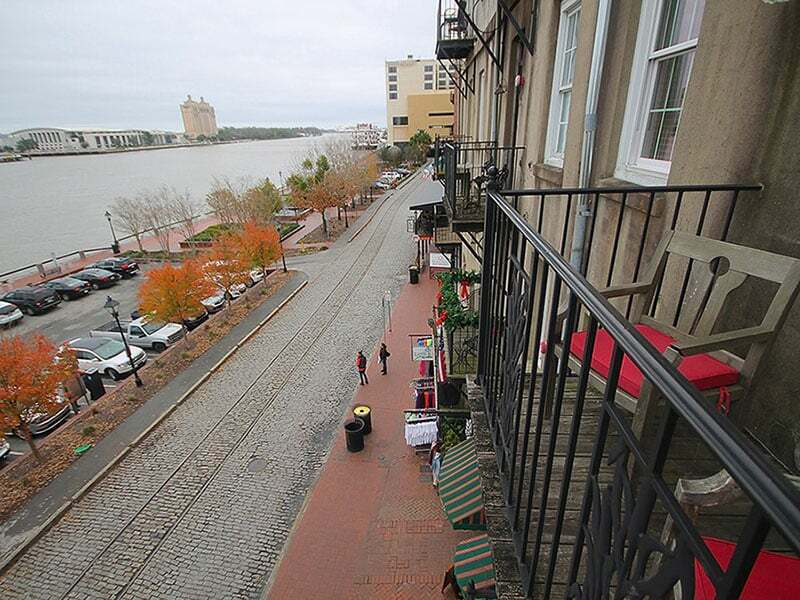 Amazing river views from your balcony overlooking River Street and the Savannah River. Watch the people and activity below as boats and cargo ships pass by on the river. Your home away from home has two king size bedrooms and its own water front dock with sunset views, nestling on a sleepy creek on Historic Tybee Island. Forsyth Park Chateau,an upper level two bedroom, two bath vacation home, overlooks historic Forsyth Park in the Historic Downtown. It was on December 22, 1864, that Abraham Lincoln received a gift from Union General William T. Sherman, following his arrival in Savannah. This year, you can prepare Thanksgiving dinner in a dream kitchen, surrounded by family in a luxury vacation rental home from Savannah Dream Vacations.